Author’s Comment – Well, as soon as my reviews of iJuror and JuryTracker were safely in the hands of Technology Editor Sean Doherty of Legal Technology News, and just in time for their brand-new site launch (looks great, by the way), I discovered that Jury Duty, yet another new iPad app, had just been released. Jury Duty is designed by Texas Attorney Stacy Kelly, priced at $39.99. I will be reviewing it for Law Technology News (see screen-shot preview at end of this article). Also, for those of the WordPerfect persuasion (as many law firms are), you will be happy to know that there is a new iPad app just for you – the WordPerfect Viewer by Corel, only $4.99 (you heard it here first). This new app lets you read, search and place bookmarks in your .wpd files. Unfortunately, you cannot edit them. I’m sure that’s on the way soon. If you know of any new legal-specific apps or other things you’d like me to consider for review, just let me know. If you have any trials coming up, I’d be happy to help out with that, too! Thanks for reading! Reprinted with permission from the Jan. 21, 2011 issue of Law Technology News. ©2011 ALM Media Properties, LLC. Reference to this review has been featured on iPhoneJD. In a recent article published in Law Technology News, "Two iPad Apps Make Their Cases for Trial," (see enhanced version here) I noted that the iPad is currently one of the hottest topics on the internet. To determine how attorneys and other legal professionals use iPads, I conducted an informal poll on LinkedIn. The results showed that, although the majority of respondents view their iPads equally, as a toy and a tool, the next-highest group used it more for work than play. And one important part of work in the legal profession is a jury trial. Two iPad apps have been developed to aid in selecting and monitoring jurors: iJuror, from Front9 Technologies, and Jury Tracker, from John Cleaves, who recently shared how to "Build Your Own App." Although both apps relate to the observation of jurors, each is focused on a different part of the process, and thus do not necessarily compete directly against one another. In fact, one might even want to utilize both apps in a jury trial -- something that won't make a big dent in your savings, at $9.99 for each. iJuror is focused more on the jury selection process, while JuryTracker is designed for use during trial. When I first started iJuror, there were four buttons showing: New Trial, Saved Trials, Stats, and CLE Credit Tracker, which is actually just an advertisement link to another app in the iTunes store. Clever, but I can live without that one. If you'd like to change the desk interface to walnut from the default mahogany, you can tap the options icon, which looks like a gear in the top right corner. 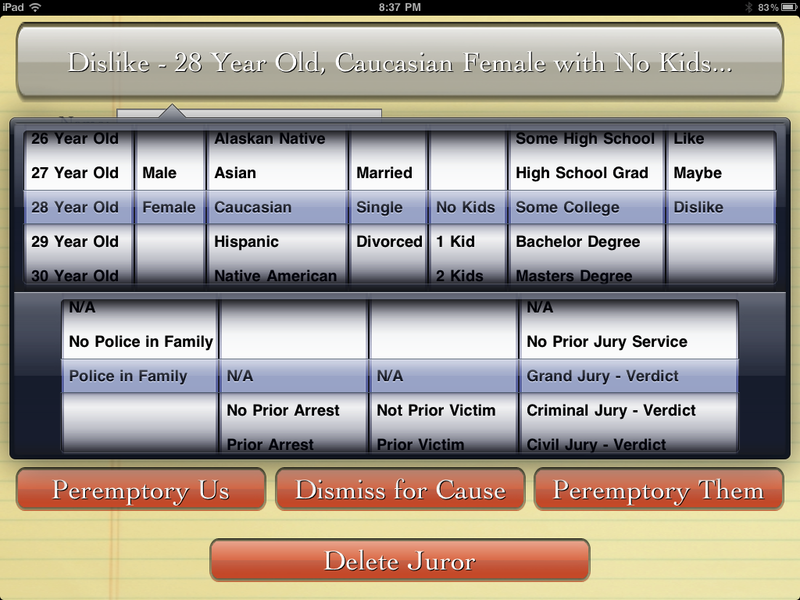 The options window also lets you change the seat in which juror No. 1 is located, and whether you'd like your last-opened case to automatically start next time you launch the app. One problem in setting where you place the first juror: the setting applies to all cases -- but not all courtrooms are set up the same. So if you have more than one case going at a time in different courts, you may have to reset the jury seating order on the app for each trial. It would be nice to save a jury seating template for each trial. I liked the look and feel of this app -- the interface is like a legal pad, complete with a pen lying on it, and moving from task to task was akin to flipping through pages on a real yellow pad. After I set the juror seating order, the next option was to create a new trial. Once I entered my case name, date, and the number of jurors and alternates, I then tapped the Save New Trial button where my information was available from the Saved Trials list. Since it takes a lot of data entry to create a case to work with, it would be nice if iJuror (and JuryTracker) was preloaded with sample case information to aid in quickly learning the app. After I created a case, I opened it and entering the details of up to 60 prospective jurors. The layout of the interface is determined by how many jurors and alternates there are. 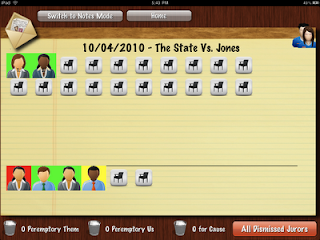 Most anyone who has been in trial with a jury consultant has played the sticky-notes version of musical chairs. Although sticky notes are a proven method of moving names and their information quickly around in a seating chart, it can be a little clumsy. In effect, iJuror can play sticky-notes, but doing the same thing on an iPad is just plain cool. I would expect professional jury consultants will be using this app, in addition to attorneys. There are a couple of ways to enter information on each prospective juror. You can tap on an empty seat, which then brings up a form where you can enter their name, work, hometown, and additional notes. You may then tap on the top line, which opens up a dialog that looks something like a slot machine (see Figure 1, below), with choices to "roll" into place: age, gender, race, marital status, number of children, education, and whether you generally like or dislike them. The information you enter is also reflected in the icon on the desktop (see Figure 2, below), including long or short hair, female or male, and skin color according to race. You can also select whether there are any familial relation with a police officer, if they have prior arrests, whether they have been a victim, whether they've served on a jury, and whether there was a verdict. These last few options also have an N/A option. Figure 2. Click image to enlarge. During voir dire and jury selection, you also have the ability to flag jurors for peremptory challenge, dismissal them for cause, or simply delete them. There is a Quick Enter feature, which allows you to quickly enter basic information: gender, race, and name. You can then complete the details later. Another option is a multiple-juror view, which allows you to view each juror and their attributes on one page. Once you have details on the jurors, you can then drag and drop their icon to another seat (to perhaps dismiss and replace a juror), or into a Peremptory or Dismissal bucket -- each bucket shows how many jurors are in it and tapping on a bucket displays its contents. This is much more fun than sticky-notes. Once you've reached the end of the day, or have completed jury selection, it would be nice to have this information available to discuss. In the upper right-hand corner is perhaps the most useful button of all -- it looks like an envelope. Tapping the little envelope will prepare a detailed report of everything you entered, and automatically generate an e-mail for you. E-mail the report to yourself, co-counsel, jury consultants, your client, or whomever you wish. That feature is quite a bit easier than photocopying an oversized sticky-note chart, or rewriting the whole thing. While the purpose and functionality of this app is somewhat limited (as you might expect from an app), it works. The first step in the process for Jury Tracker is to set up a new case file. While there is an option to select previously created cases, there is no sample case included. As noted above, sample data would be helpful to quickly learn the app. Setting up the case information is somewhat automated, in that once you complete one field, you automatically advance to the next -- a nice touch. While some fields bring up the keyboard for data entry, others have a drop-down menu with a few common choices to select. Everything worked out nicely until I had to enter the number of jurors and alternates. I was forced to select either 6 or 12 jurors, and then from 0-2 alternates. There needs to be an option to enter any number in each of these fields -- especially with the introduction of laws such as California AB 2284, the Expedited Civil Jury Trials Act, which allows only eight or fewer jurors, with no alternates. The next step is to choose the jury layout. In the Jury Layout (see Figure 3, below), you can quickly assign gender and race with a single tap; double tapping an icon will open its full details, which offer a similar set of input fields as iJuror. Figure 3. Jury Tracker Jury Layout. Click image to enlarge. Although JuryTracker is not very flexible with the number of jurors, and although iJuror seems to have an advantage with the jury selection process (since that is what is designed for), it begins to show its real benefit from this point forward. 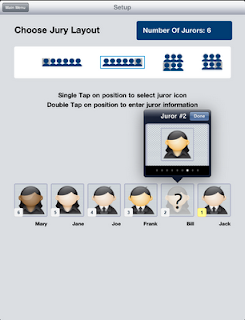 Selecting the JuryTracker option brings up a screen showing icons with the names of all the jurors, with their gender represented by hair style (all brunettes), and race as indicated by skin color. 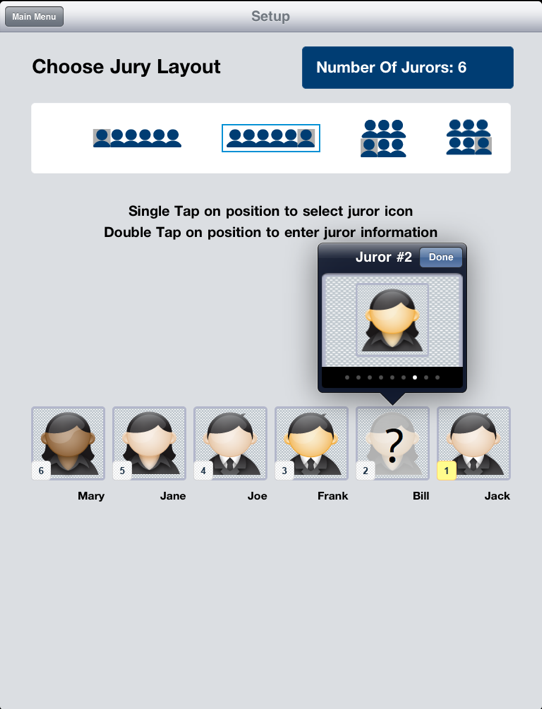 A single tap brings up the Juror Observation screen (see Figure 4, below), which allows you to select from a number of emoticons (think smiley faces) to assign to your juror, along with other notes, e.g., whether they are a key juror, and are leaning toward plaintiff or defense. Figure 4. Jury Tracker Jury Observation. Click image to enlarge. The TrialTimer is a handy stopwatch which may be used to keep track of how long each party is presenting. This can be a very helpful feature when time limits are imposed. It would be even more helpful if it prevented the iPad from going into sleep mode at around 5 minutes, which stops the clock. The clock did not count the time when the iPad was asleep. Note that there are helpful on-screen tips available throughout the app. At the end of the day you can select the Reports icon, which lets you save juror information to a text file. The report can be e-mailed or exported to a CSV file and imported into a spreadsheet. Once in a spreadsheet, the report can be sorted by juror, party presenting, or juror responses. The format of the report is nicely detailed, including all of the information you've noted on each juror, and even includes the date and time you made each entry. You can also generate a report showing how long each party has spent presenting their case. JuryTracker would be particularly helpful in long matters. So, which app is better, and which one should you shell out $9.99 for to help you select and keep an eye on those jurors? Well, unlike my comparison of TrialPad and Evidence, where both iPad apps were direct competitors, in the right scenario, you might actually want to add both iJuror and JuryTracker to your i-Arsenal. iJuror has its advantages for use during voir dire and the jury selection process (no more sticky-notes! ), while JuryTracker helps you track each juror during the trial. For less than twenty bucks, you can get them both. Wow, they should combine the two and make one decent app. The flexibility of custom fields of Jury Tracker and the features of IJuror. Just tried JuryTracker in a trial this morning. I agree -- they need to offer more flexibility in setting up the number of jurors and seating arrangements, and it wasn't clear how to deal with alternates. I also had problems with the program repeatedly crashing - ending up taking "old-fashioned" notes and filling in the rest of the data after court. Hope they can work out some of the bugs in their next update. We've continued to update iJuror throughout the last year and we've added some additional features that will be helpful - including a juror pool manager that can be used before the seating chart is provided. iJuror was also the only juror selection app to earn an A+ Technoscore from Technolawyer.com. 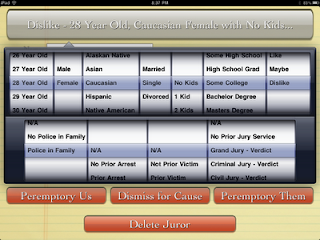 iJuror beat out two other juror selection iPad apps to win this honor. between i Juror and Jury Duty which would you recommend? It would be difficult for me to recommend one over the other, since they are similar in purpose, and I don't use either one enough to have a strong preference. You may like the "look and feel" of one of them better than the other. That stated, it is interesting to follow app progress. 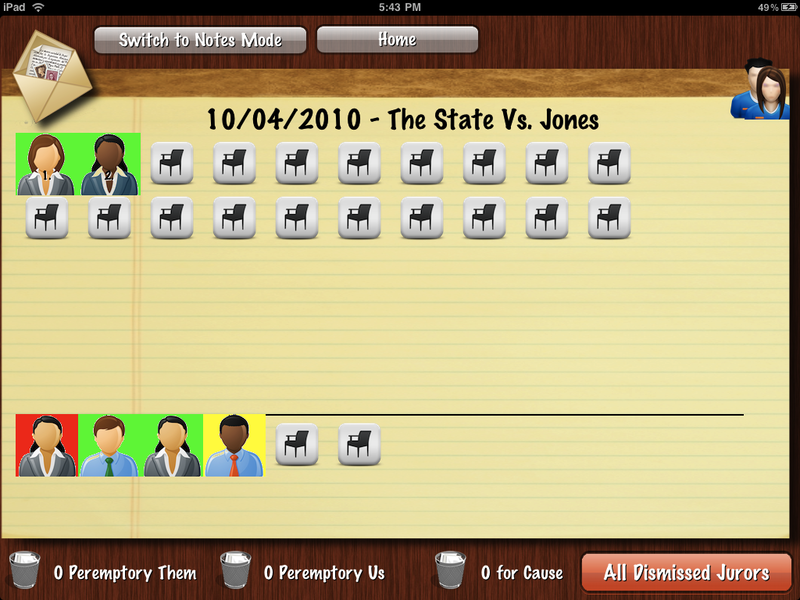 iJuror ($19.99) has a recent update as of 11/12/2012 (version 1.58, indicating several updates), and JuryDuty ($39.99) received its first and only update to version 1.0.1 on 3/3/2012. iJuror also develops several other apps, and seems to provide frequent updates for all of them.